C 1884 OTOE INDIAN CHIEF WHITE HORSE, LENNY & SAWYER Purcell Indian Territory OK. Circa 1884 Cabinet Card Photograph; Portrait of Native American Indian Chief, Richard White Horse of the Otoe-Missouria Reservation in Oklahoma. Depicted is the stoic warrior in tribal costume, with beads, medallions, and pipe tomahawk. 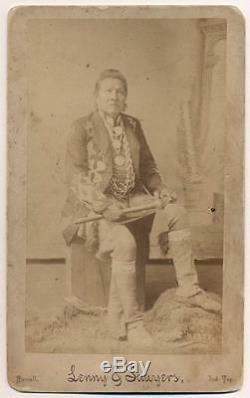 Identification in negative of image reads; "Otoe Chief - White Horse". Photograph by Lenny & Sawyers of Purcell, Indian Territory, Oklahoma. Approximate mount size is 5-1/4"x 8-1/2". Condition: soiling, occasional dings, scuffs, toning, edge wear and spots. Please see photos for additional condition review. Show off your items with Auctiva's Listing Templates. The item "C 1884 OTOE INDIAN CHIEF WHITE HORSE, LENNY & SAWYER Purcell Indian Territory OK" is in sale since Thursday, February 11, 2016. 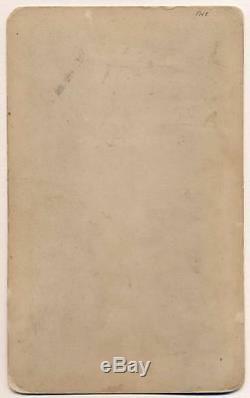 This item is in the category "Collectibles\Photographic Images\Vintage & Antique (Pre-1940)\Cabinet Photos". The seller is "gallerybfa" and is located in Pittsburgh, PA. This item can be shipped worldwide.